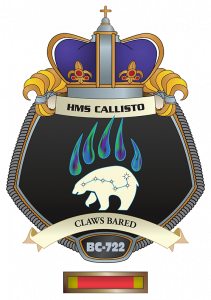 Welcome to the online home of the Battle Cruiser HMS Callisto (BC-722), a chapter of The Royal Manticoran Navy: The Official Honor Harrington Fan Association for fans of the Honorverse series of military science fiction novels by science fiction and fantasy author David Weber. HMS Callisto is a Nike class battle cruiser attached to Victoria Station, patrolling throughout Western Canada (BC, AB and SK) and Alaska. Victoria Station reports to the 10th fleet of the RMN (also known as the Talbot Fleet) which encompasses the west coast of North America – California (CA), Nevada (NV), Oregon (OR), Idaho (ID), Washington (WA) – plus the pacific islands of Hawaii (HI). Callisto was commissioned on Feb 28, 2015 and her home port is Vancouver, BC. If you are a resident of these regions and a fan of the Honor Harrington universe, we invite you to find out more about our chapter and sign up for more information. Even if you are from areas further afield, the Callisto is open to all and will accept crew from anywhere across Canada, the United States or the world – she currently has some crew members from Idaho, USA, and Alberta, Canada. In essence, everyone who is interested is welcome to join!